The Ubele Initiative and Locality’s national report entitled “A Place to Call Home”, highlighted an urgent need for BAME communities to be offered targeted support, advice, capacity building and investment to enable them to retain and build sustainable community business models because assets they ‘owned’ are being lost. 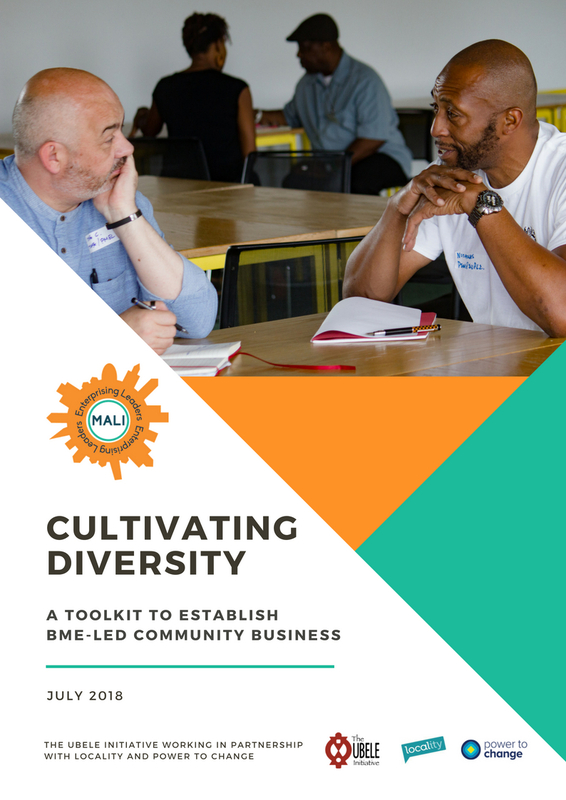 In response to that Mali Enterprising Leaders was the first community business pilot project which sought to create community business opportunities intergenerationally within BAME community organisations in the UK. Mali project involved five elements. Firstly, an invitation only selection process (eight organisations have already expressed interest). Secondly, a capacity assessment at the beginning and end of the project to measure progress and organisations’ capacity to develop a community business and manage their asset. Thirdly, local facilitators mentoring and assisting organisations to access specialist business support and monitor project implementation. Fourthly, focus on catalysing the next generation by identifying and supporting at least 10 BAME next generation community entrepreneurs (18-30 year olds who already have or can develop a relationship with organisations included in the pilot). Finally and possibly most importantly, development of the evaluation processes that was used throughout the pilot to contribute to broader learning through collaborative and empowering action research approaches. Mali Enterprising Leaders was delivered between January 2017 and May 2018. 198 Contemporary Arts and Learning (198), is a visual arts space that grew out of the social unrest of the 1980’s as a regenerative project to empower the local community in Brixton to express themselves creatively. 198 was and still is a showcase for art from a wide range of backgrounds to extend the debate on race and emergent identities in the UK. Advocating for diversity within the visual arts and provide opportunities for those wishing to develop careers in the creative and cultural industries. Since its foundation, 198 has been committed to ensuring that training, participation and showcasing young people is integral to its work. 198 continues with this commitment today through the integrated nature of its artistic and participation programmes. One of their many programmes is HustleBucks, a social enterprise created in 2010 and based in a retail space in Brixton village. HustleBucks is led by local young people with the aim of creating a hub for youth enterprise in Lambeth. Hustlebucks has grown incrementally since 2010 and has recently collaborated with Adidas designing and making products for sale and PR purposes. The past 18 years, Carnaval del Pueblo has delivered great, ground breaking, exciting and diverse annual Burgess Park based Carnivals. The large-scale events reveal and share with Londoners the authentic 19 country Latin American cultural heritage of music, dance and food in London. CDP’s aim is to increase the awareness of and create an understanding of the vibrant cultural heritage of the 19 Latin American countries, drawing in from the wider community too. CDP has now acquired 3 disused shop fronts in the heart of the 'in decline' East Street market, that will be regenerated. This will be the new home for the Latin grass roots Quarter in Elephant and Castle for its micro informal business start-ups. Targeting Latin, young entrepreneurs, often asylum seeker/refugees in the local Latino community. The Lewisham Sports Consortium (The Consortium) is a voluntary organisation set up in June 1998 by a group of committed individuals from the local community in Lewisham. The main aim of the organisation is to benefit the community through charitable means; especially the BME community residing in the London borough of Lewisham. The consortium achieves this by, providing and assisting in the provision of facilities for sport and recreation, advancing public education for children and young people through the provision of physical and mental education and training programmes and meeting the needs of the local community through volunteering, participation in sports and sports development. In 1998, the Consortium took over a disused and run down area of land in Lewisham and transformed the land into an area suitable for sports and other outdoor activities. This has enabled the sports ground to be used for various activities such as football matches, summer and holiday play schemes as well as The Consortium becoming providers of fitness and exercise programmes for adults, delivery of cultural and educational programmes and much more. Manchester Congolese Organisation (MaCO) is a volunteer led organisation engaging Congolese people and local BME groups in Manchester to reconnect and rebuild their lives so they can achieve their full potential and contribute to the local community. MaCO provide a range of services to the Congolese and wider community in Manchester. Such as translation and interpretation services, financial advice and employability, health advice services (this includes early prevention mental health, healthy lifestyle and nutrition, health advice and advocacy) and education services (this includes a youth club, IT, cultural activities, languages and sports). They are in the process of taking over a disused community centre through a local authority transfer which will become a hub for several local groups. Making Education a Priority (MEaP) is an education consortium that currently runs 4 supplementary schools. These schools are based at Highway Hope in Levenshulme, West Indian Organisation Coordinating Committee Supplementary School in Longsight, GIFT at the Windrush Centre and a Twilight school at Manchester Metropolitan University’s Brooks Building in Hulme. The wider consortium of stakeholders also includes Manchester Metropolitan University, University of Manchester, Manchester Museum, University of Salford, MOSI. The key purpose of our supplementary schools is to deliver core curriculum subjects in Key stage 1, 2, 3 and 4 in English, Maths and Science. We also aim to provide innovative, creative, vocational courses to engage/prepare 14-16 year olds for Further Education/Higher Education, employment, enterprise or apprenticeships. We offer personal development workshops consisting of study skills, Career/University/College advice. The model that will be developed includes working towards the creation of a physical hub and spoke system of support to these four educational groups plus the growth of the existing model of community enterprise to help increase MEaP’s sustainability. TAP is a community led initiative to collectively fund & deliver services for diasporic Africans in local communities. They led our contribution to the growth of the next generation of BAME community entrepreneurs aged 18-30 yrs. TAP organised youth enterprise events in Manchester where they worked with the young entrepreneurs aged between 18 – 30 yrs from our case study organisations in Manchester.